For a violinist, no greater or more pleasurable challenge exists than to tackle the six unaccompanied Bach Sonatas and Partitas. Ordinarily a recitalist will perform one of these magnificent works in a single program. 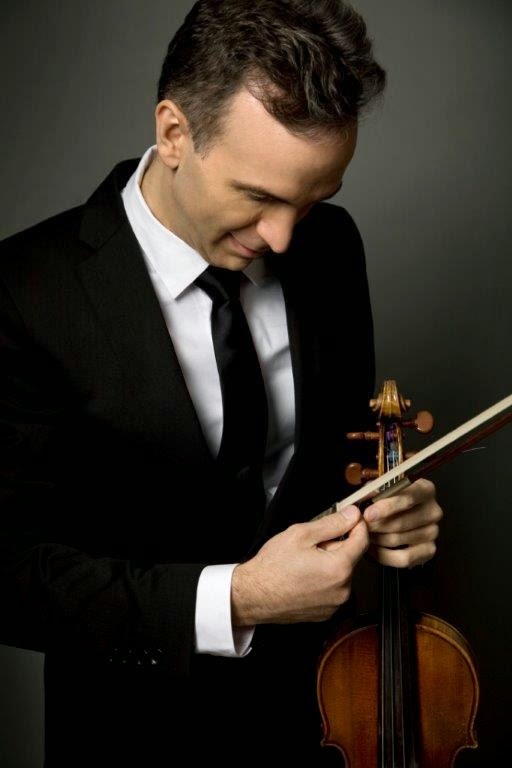 As part of his Solo Bach Project, which takes him to some of the country’s leading venues, award winning violinist Gil Shaham pushed the envelope by programming three of these works in one evening at the La Jolla Music Society (http://ljms.org): Sonata No. 3 in C major; Partita No. 3 in E major; and Partita No. 2 in D minor, which includes the glorious Chaconne. This particular weekend is well timed for the E major Partita: the San Diego Symphony performs Ellen Taaffe Zwilich’s Upbeat!, which pays homage to the partita’s Preludio. Bach himself brilliantly captured said Preludio (though in the key of D major) in his Cantata No. 29. He certainly knew how best to make use of his expertise. As did Mr. Shaham. The extent of Bach’s proficiency on the violin was never clearly chronicled, but Shaham’s deftness and skill were very much in evidence as he powered his way through these fiendishly difficult works, in which there is absolutely nowhere to hide: the player is responsible for all the voices, from melodic to inner to bass line. Shaham demonstrated that a single instrument with but four strings and a bow is capable of replicating an entire string quartet’s voicing and sonorities. One of the keys to producing these qualities in unaccompanied Bach is in fact the use of the bow - which in its modern incarnation does not entirely resemble the arched bow of Bach’s time - to produce sound, not only drawing it from individual strings but from two, three or all four simultaneously. In this sense “unaccompanied” more accurately means, “accompanying oneself.” Shaham proved this feat eminently achievable and, in his skilled hands, demonstrated that the solo violin needs no accompanying aid from a piano, or even an orchestra. His choice of Partita No. 3 as an opener was perfect. He engaged the audience’s attention immediately by establishing intense eye contact while simultaneously executing the dazzling string crossings and relentless barrage of never-ending sixteenth notes. Shaham performed these with dexterity and nimbleness at breakneck speed without sacrificing the beauty or quality of the tone. Shaham’s interpretations of these unaccompanied works have been termed “original.” Certainly his somewhat idiosyncratic interpretations were in evidence in the dance movements of both partitas, where the violinist cleverly incorporated a generous sprinkling of carefully calculated ornamentation that gave the impression of being improvised. Added to the highly stylized 17th century phrasing, the embellishments contributed a great deal of stylistic pizazz to the overall dancelike character of those pieces. In the three unaccompanied sonatas, each Adagio and fugue becomes progressively more difficult, and of these the opening Adagio of Sonata No. 3 is the longest, most arduous and most problematic. The intricacies and juxtapositions of the fingerings and the compound undulating of the chords require a monumental command of both bow and left hand. Shaham the artist was in his element, if a bit rushed, in this Adagio, and in the segue fugue movement, which also is of extended length. He articulated the cascades of notes and chords with great clarity. He expertly executed the multiple voices, bringing out melody and counter melody distinctly, and using his superb bow arm to cluster together the multiple voices of the fiendishly difficult chord structure: a nigh impossible feat with a modern bow. Perhaps the true mettle of any violinist is being able to master and perform the Chaconne. As effective as the E major Preludio is as an opener, the Chaconne is equally winning as an ending. Even more challenging is to perform the four dance movements preceding it without losing the momentum required to sustain the technical demands of the final movement, which can easily stand on its own, not to mention the profound emotion contained within its expressive melody and harmonic changes. The violinist’s energy never flagged during the entire work. The dance movements meshed into each other yet remained distinctly individual, leading up to the ultimate long-awaited Chaconne. Performed with conviction, if unusually fast, Shaham made the piece his own, successfully tackling its technical challenges. Shaham’s courage in assembling these three stupendous works for one program paid off generously, earning the delight and admiration of a captivated audience.